I distinctly remember buying my first frozen ‘ready meal’ as a student in the 1980’s – a Sharwood’s Beef Bourguignon. It was eye-wateringly expensive (over £2!) but it looked ravishingly delicious and sophisticated in its glossy white box. Studying for a Chemistry Ph.D at the time, I had no clue that I would spend my career in brand design; but I have no doubt that this incident sparked a sudden deep respect for the power of something as seemingly prosaic as packaging. 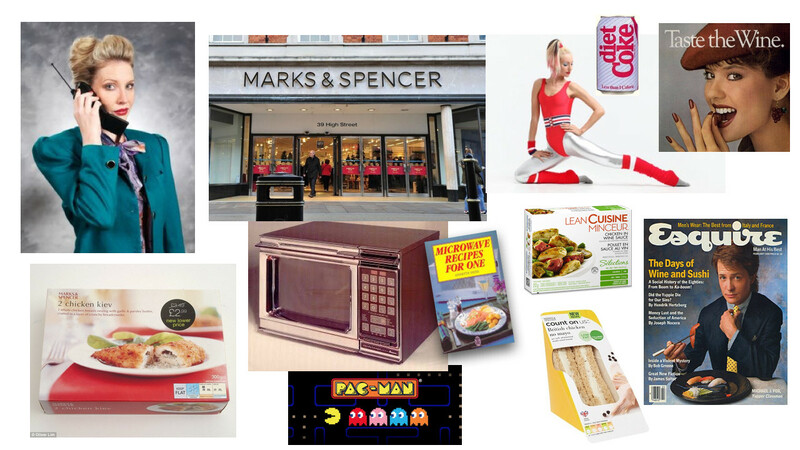 The 80’s was a transformational decade in many ways, as the dark days of 1970’s industrial strife gave way to Thatcherism, free markets, Yuppies, microwaves and their natural partner: the Ready Meal. This decade of economic prosperity saw a rapid rise in the number of working (or ‘career’) women. This led not only to more conspicuous consumption of food & drink in newly fashionable wine bars, but it also heralded the rise of restaurant-inspired ready meals. Marks & Spencer seized the opportunity and suddenly became equally famous for food as for their core business of fashion. Nowadays it’s the food business that seems to keep the company afloat, as its clothing sales regularly underachieve. But ever innovative in the food hall arena, M&S also gave us the pre-packed sandwich, so that we could eat lunch quicker too. 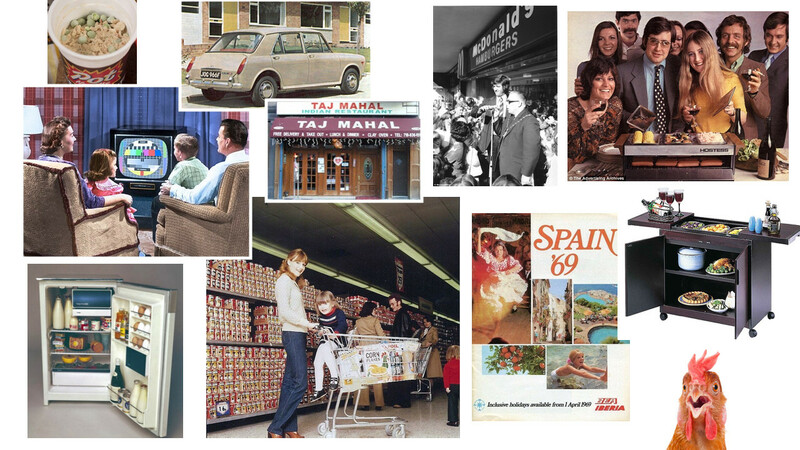 Looking back to earlier decades, it’s interesting to see how food culture has always been driven by technology: as more and more people owned cars, we drove to supermarkets to buy packaged goods, to store in our kitchens fitted with new appliances. We also drove to US style ‘fast food’ outlets, or the growing number of Indian or Chinese restaurants & takeaways. We took more foreign holidays, and together with home entertaining (for which the gadget du jour was the Hostess trolley) we increased our knowledge and consumption of food and wine. Fridges were not universal until the end of the 60’s, and until Freezers started to become popular at the same time, canned and dehydrated were the dominant technologies in convenience food. Meanwhile at home we watched TV, and from 1969 the adverts for new foods like Vesta meals and Smash dried mashed potato were even in colour! Another technology (that we’re not so proud of anymore) made chicken the most popular protein source in the world. Before ‘battery farming’, it was an expensive treat in the UK. 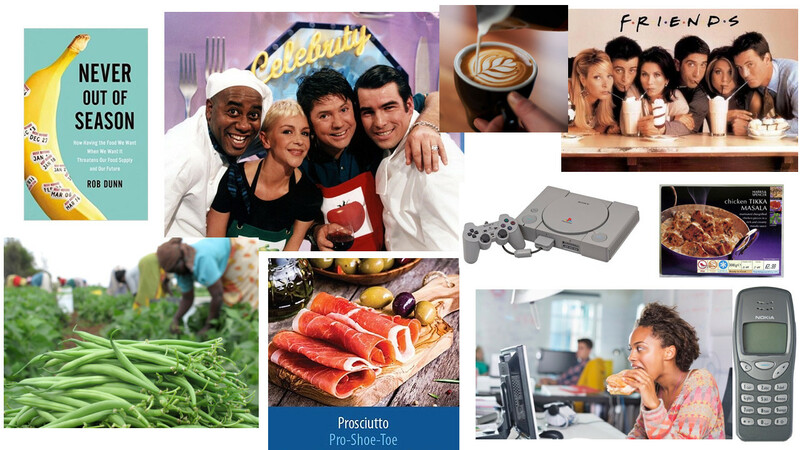 Leaping forward to the 1990’s, our food education was turbocharged with the rise of Celebrity TV chefs and cooking shows. At the same time the availability of the produce needed to emulate their creations became more widely available, grown around the world but air-freighted to your local supermarket within hours. Once a nation of tea drinkers, we quickly took to coffee shops and skinny soy lattes, encouraged by hugely popular TV shows like ‘Friends’. The iPhone and its followers changed our lives in so many ways that it will certainly rank up there with the printing press and internal combustion engine when the history of humanity is next re-written. From a food perspective it’s brought us millions of food bloggers and hundreds of millions of photographed lunches, dinners and street food. These images and opinions, shared with the world through social media, joined forces with the still growing ranks of Celebrity Chefs to accelerate our adoption of new trends and tastes. 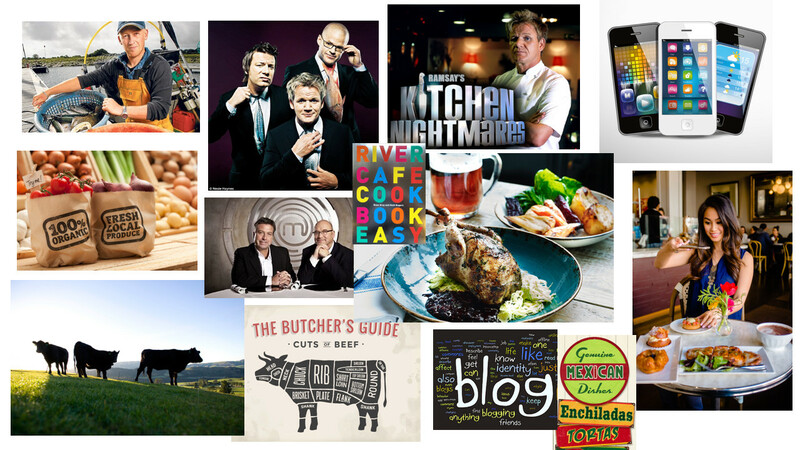 During the Noughties, people like Jamie Oliver, Gordon Ramsay and Heston Blumenthal became superstars, whilst competitions like Masterchef seemed to be always on our screens. Nothing has changed there. Pubs declined while ‘Gastropubs’ came into their own, serving rustic, quality British classics with a contemporary twist; as seen on TV. Today, as the internet has democratised information, enabled community building through social media and fed the boom in online retailing, so the prospect of building a food or drink brand is within reach of Entrepreneurs, not just deep-pocketed Corporations. They have responded in their droves, creating myriad new food and drink products that have completely changed the landscape of what, why and when we eat and drink. 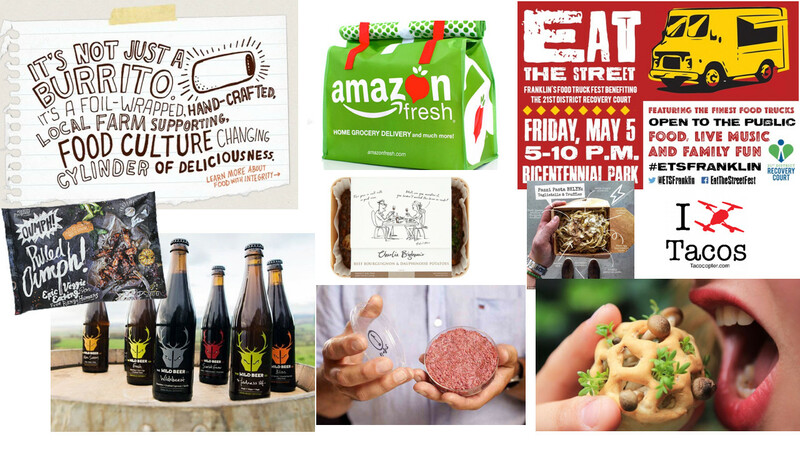 From organic to vegan, local and seasonal, small-batch and hand-crafted, low-fat and high-protein, traditionally fermented to laboratory-grown, Food has become an experience. Better than that: entertainment. Perhaps even fashion. Mouthwatering pictures of food are everywhere – online and especially on Instagram. You Tube is overflowing with cool videos that make cooking (remember that?) look easy and pleasurable. Food Blogging has gone Pro, and Craft foodies (as well as Craft Brewers) are treated like rock star DJs. Food is celebrated at hundreds of street food markets and even Festivals.